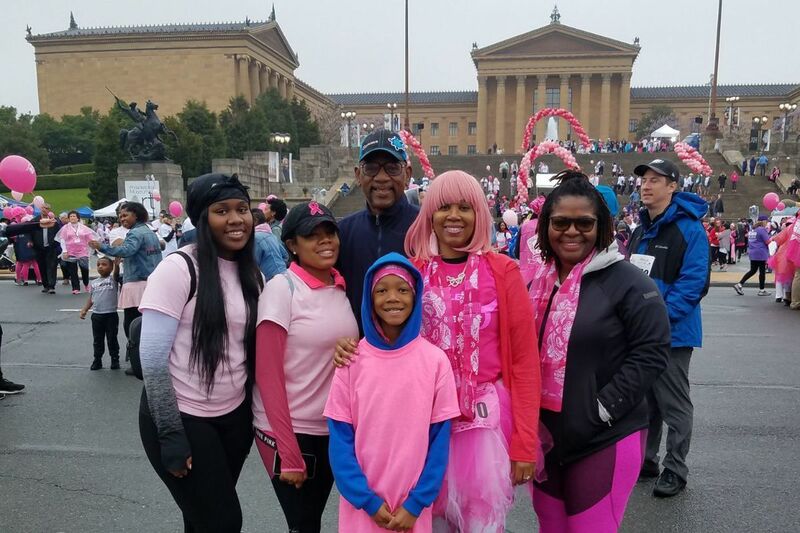 Last year, Kenya Harris (wearing a pink wig) and her family celebrated her breast cancer recovery by joining the annual Race for the Cure. Son Reece, 10, is in front, and daughter Makaylah, 20, is next to him in the pink ribbon hat. When Kenya Harris was diagnosed with breast cancer, she took some comfort in knowing she would be treated at the Hospital of the University of Pennsylvania, where she had worked for 13 years as an anesthesiology technician. But the 48-year-old woman from Upper Darby is now suing Penn for firing her when she asked — based on her oncologists’ advice — to extend her nine-month medical leave for 27 more days. A Penn Medicine spokesperson said the health system cannot comment on pending litigation. However, the letter terminating Harris said granting the extension “would pose an undue hardship for the anesthesia department” — a contention that she said was never previously raised. Her lawsuit, filed Monday in federal district court in Philadelphia, says her firing not only violates state and federal laws protecting the disabled, but also is at odds with Penn’s reputation as a leading breast cancer treatment center. “This employer proves itself to be unworthy of such esteem by its vile treatment of its own employee (and patient) in the midst of battling cancer,” says the complaint, filed by attorney Jason Pearlman. In July 2017, Harris said in an interview, she felt a lump in her breast. A mammogram and biopsy at Penn quickly led to her first surgery — a lumpectomy and a check of her armpit lymph nodes. The cancer had spread to the nodes, requiring more aggressive treatment. She underwent a mastectomy in September 2017 and was scheduled for 16 weeks of once-a-week chemotherapy, followed by six weeks of daily radiation. Chemotherapy caused all that and worse, Harris recalled in the interview. But it was the radiation that led her and her doctors to request that her leave be extended by 27 days, to May 14, 2018. “After six weeks of radiation, I was burned really bad,” she said. “The skin was really tight. I had a few open wounds. It hurt." The health system’s Office of Disability Management replied that per Penn’s policies, her department supervisor and others would engage in an “interactive process ... to determine if there is a reasonable accommodation that can be provided without imposing an undue hardship," according to the lawsuit. Instead, the complaint says, Harris had two unpleasant phone exchanges with a personnel department representative who twice hung up on her. Then the April 18 termination letter arrived. Harris said she was shocked, partly because no one had ever suggested her job was in jeopardy, and partly because many of her coworkers had been kind during her treatment. Although Harris said she is now healed and has no evidence of cancer, she is not in good financial shape. After exhausting her disability and unemployment benefits — which paid a fraction of what she earned at HUP — she fell behind on rent and had to move with her two children into her mother’s house in Upper Darby. Harris is now working part-time as a classroom aide in a local school. “I’ve applied all the way to California for anesthesiology technician jobs, but there isn’t much demand,” she said.